Last month, Mozilla Foundation employee Jess Klein was honored by the White House Office of Science & Technology Policy as a Champion of Change for her work with Rockaway Help in the wake of Hurricane Sandy. Before the White House event, Mozilla sponsored a Civic Hackers’ Happy Hour in DC at canvas.co. Here’s an excerpt about the event from the Code for Tulsa write-up. We arrived at canvas around noon to arrange all the catering and set everything up. We met fellow civic hackers from Austin to Chicago, Minneapolis to Miami, Oakland to DC, and everywhere in between – hackers and officials representing Code for America, Sunlight Foundation, E-Democracy, United States CTO, Census Bureau, NASA, FEMA, USDA and many others. By 8pm we had about 100 people, so we had a few quick presentations – I spoke about Mozilla, Kevin Curry spoke about the Code for America Brigade program, and Garret Miller spoke about Mapbox. Everyone mingled and we learned about some great civic projects going on like the Smart Chicago Collaborative, mspbus.org in Minneapolis, and Keep Austin Fed. We had made a congratulatory card for Jennifer Pahlka, founder of Code for America and recently-appointed Deputy CTO of the US. Everyone had a chance to sign the card, and then… Jennifer showed up! So we presented the card to her in person! In my presentation about Mozilla, I discussed how I’ve come to realize that openness, innovation, and opportunity on the web is at the heart of developers improving their communities. In 2011, I found Mozilla Foundation Executive Director Mark Surman’s City of Toronto 2.0 Web Summit presentation from 2008 – A city that thinks like the web. Mark tells the story that seems obvious to us now – Mozilla believed that participation could create a better internet, and the tiny non-profit with a global community of volunteers forced open a monopoly browser market with standards and protocols that have created the largest communication platform in the history of the world. If openness and participation created a better web, could it create better cities? Mark says yes. After a couple of years hacking my city, I completely agree. 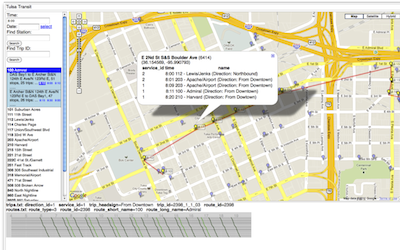 I first started civic hacking in 2011 when our Tulsa Web Devs group took it upon ourselves to put Tulsa Transit on Google Maps. At the time, we knew nothing about transit, and only a little about Google Maps. In a few short hack days with web resources, we taught ourselves everything we needed to convert route shapefiles and schedule csv files into a valid GTFS feed. As soon as I saw the prototype working, I was hooked on civic hacking. It was the same feeling I had when I received my first patch for my first open-source project. In a way, my personal journey – from proprietary enterprise software development, to SourceForge, to Mozilla and Code for Tulsa – reflects trends in open technology: open source disrupted proprietary software and brought forth the open web, the open web brought forth open government and civic hacking. The future of the web won’t be decided by corporations, governments, or shareholders. It will be chosen by people like you and me – passionate individuals with great ideas, who won’t take no for an answer, who won’t settle. Having worked with and for corporations, shareholders, and now governments, I know just how true this statement is. On the web, Google’s latest billion-dollar project and Code for Tulsa’s $35 raspberry pi hack are both a single link – a single click. The web platform is the only platform designed to include everyone at an equal level of access. Mozilla’s mission is to promote openness, innovation, and opportunity on the web. It’s a lofty goal; sometimes it’s hard to see what that looks like “on the ground.” At our happy hour, I saw it: designers, engineers, programmers, entrepreneurs – hackers experimenting and making amazing things for the betterment of their communities.